At this point, we have a working version of the Solar Sunflower: An Arduino equipped with a WiFi shield sends sensor data to a server. Some of you might be wondering where the code is. The short answer is that it’s at our GitHub repository (more on this shortly). 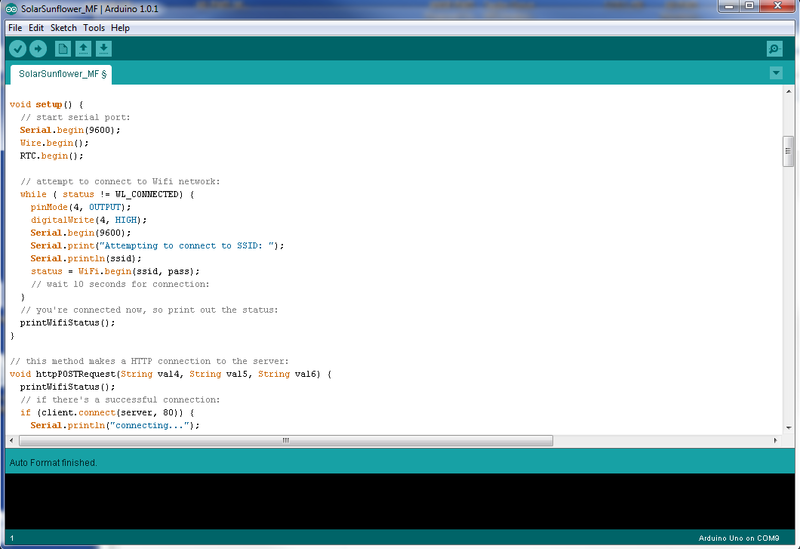 There you can find the Arduino code (a screenshot of it is posted above), the Ruby code for the server, and documentation and revision history. We’ll definitely be discussing the project’s technical issues in this blog, but it isn’t meant to be a documentation of our code. The code is going to change many times over the course of this project, and it isn’t always interesting or productive to list every little change here. Go to GitHub. GitHub is a website that hosts files for tech development projects. It’s kind of like Google docs for programmers. GitHub allows multiple people to work on code separately, then merge the changes back into one file. Groups of files (for a certain project, for example) are collected in one location called a repository. 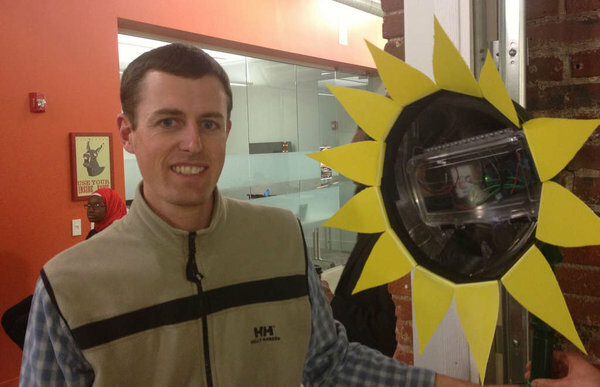 Chris Nies, Kevin Clough, Jason Blanchard and I did a five-minute presentation and complete demo of the Solar Sunflower. We put the sunflower in a bucket of soil, poured some water into the bucket, and watched (apprehensively—soil moisture is not the most dynamic thing in the world) as the website updated data values in real time. A total success, and we took second place in the competition. 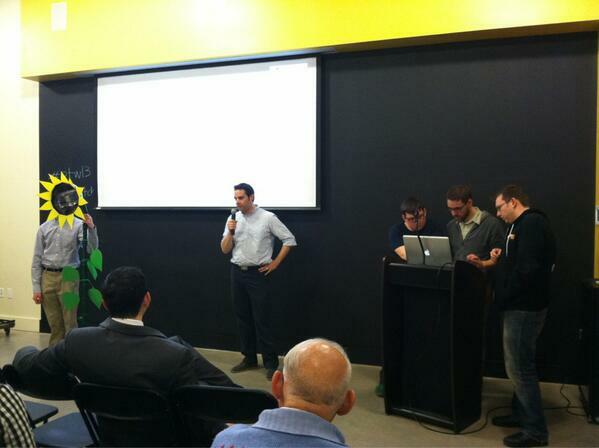 Congratulations to the winning team (Temple MESA), a group of students who devised a tutoring application. Here’s some more coverage on Technically Philly. Here we are at Switch Philly, with the sunflower doing a total eclipse of Tommy’s head. 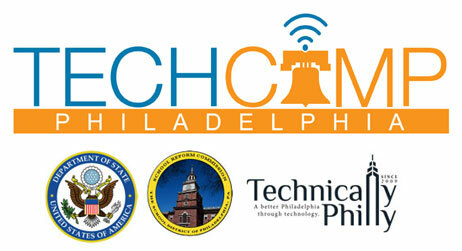 TechCamp is a U.S. State Department program that connects technologists (I don’t like this word, btw) to people who are trying to solve social problems. Many of the previous TechCamps took place in cities in developing countries, and as far as I’m aware this is the first domestic event. 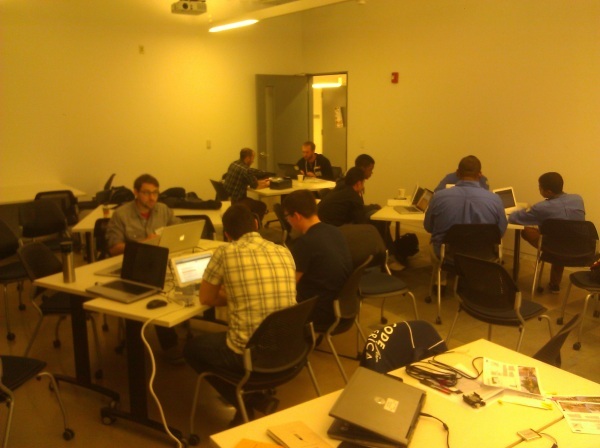 It’s a sign of the times: Co-sponsored by the School District of Philadelphia and Technically Philly, this hackathon focuses on our city’s public schools and finding ways to use technology to improve education and administration. The two-day hackathon—the part where programmers and software developers work on a project, such as a mobile app for students—was only one element of TechCamp, but it was the part that enabled the Solar Sunflower project to grow some legs. 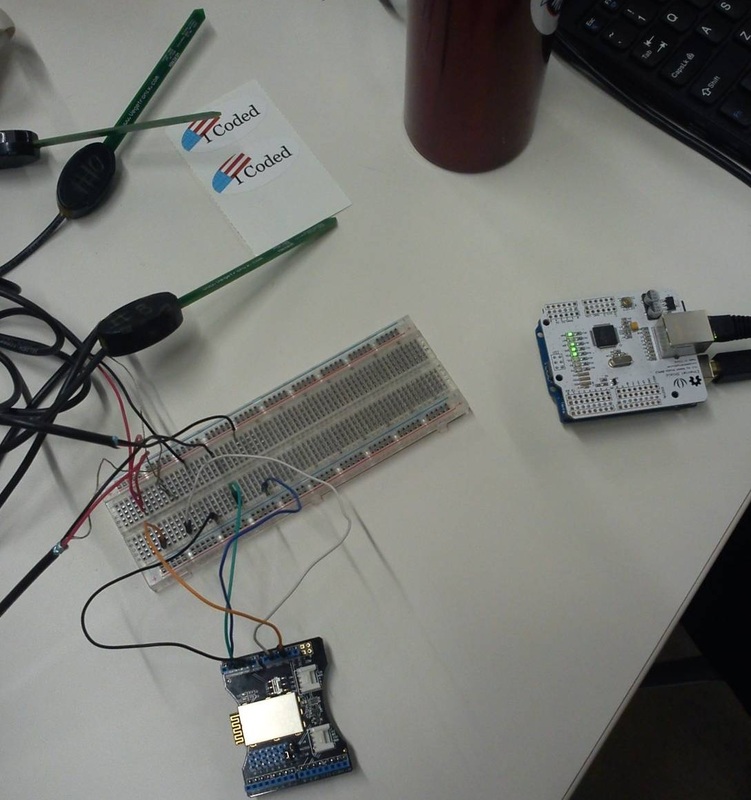 After I explained the project and gave some background information, Chris, Kevin and Jason had a plan of attack in place within minutes: We’re going to send JSON packets containing sensor data over wifi from the Arduino to a Ruby on Rails application running on Heroku. You got that, right? Heroku is a cloud hosting platform. It’s a place to put a website. It’s free, up to a certain point of usage. This makes it a smart choice for projects under development. Even though I arrived with a duffel bag full of electronics—Arduinos, sensors, breadboards, cables—at one point I had to steal away to Radio Shack to buy the Ethernet shield for the Arduino. It cost around $20. Now, I’ve become a semi-regular customer at various local Radio Shacks since embarking on this project, and I’ve never underestimated the base-level weirdness of the Shack’s clientele. But this time was special: A lady, perhaps thinking I worked at the store, asked me which digital converter box would scramble signals from her TV … because the people from the TV were accessing her brain and stealing her thoughts. But I digress. Our team wasn’t able to do a live demo of the sensors transmitting data to the web, but we gave a solid closing-night presentation in front of a great audience of educators and the tech community. Best of all, the team resolved to keep working on the project, and we’ll get together at Code For Philly meetups in the future. More than anything, I was astonished at the level of interest and support for this project and hope to keep the momentum going.